Bank regulators and Congress are currently considering measures that could have a significant impact on the cost for banks financing the acquisition, development, or construction (ADC) of real property. Under current banking rules that took effect on January 1, 2015, ADC loans that fail to meet a complex set of prescribed prudential safeguards are characterized as high-volatility commercial real estate (HVCRE) loans. Banks are required to carry 50% more capital to support such loans than the capital generally required for commercial real estate loans because HVCRE loans are considered riskier. Higher capital on such loans translates into higher financing rates. As a result, banks have worked hard to structure ADC loans to avoid HVCRE characterization. However, banks have found it difficult to know for sure when they have succeeded. In addition, it is not clear that certain ADC loans that clearly fall within the HVCRE ambit are in fact riskier, and therefore merit higher capital. In sum, the existing rules may impose unintended or excessive burdens on ADC lending and increase rates to borrowers. First, the federal banking agencies published a proposed rule in October 2017 to address the capital treatment of ADC loans (the “Proposed Rule”). Both H.R. 2148 and the Proposed Rule would change the scope of loans subject to the higher capital charge by redefining what constitutes an HVCRE loan. In some important respects, the initiatives take the same approach. For example, both the Proposed Rule and H.R. 2148 clarify when a loan constitutes permanent financing and thus is not an HVCRE loan. Under both proposals, a loan generally qualifies as permanent financing where cash flows generated by the real property are sufficient to support the debt service and expenses of the real property. In addition, each proposal would appear to permit the reclassification to permanent financing of a loan, without a formal restructuring, upon the generation of cash flow by the real property sufficient to support debt service and expenses. However, the Proposed Rule is generally more restrictive than the Congressional approach and may in some cases increase, rather than alleviate, the overall capital burden on ADC lending. For example, the Proposed Rule would make more loans subject to the higher capital charge by eliminating an important exemption to HVCRE characterization. Under this exemption, development and construction loans are not HVCRE exposures if (i) they meet applicable loan-to-value ratios; (ii) the borrower has contributed capital of at least 15% of the real estate’s “as completed” value; and (iii) the capital contributed to, or internally generated by, the project is contractually required to stay in the project through the life of the project. Many such loans have been structured by banks with painstaking care to fit within this exemption. Under the Proposed Rule, the federal banking agencies propose to eliminate the exemption altogether based, apparently, on the rationale that the exemption is too complicated to administer. To compensate for the broader swathe of ADC loans that would be subject to a higher capital charge by the elimination of the exemption, the Proposed Rule would require HVCRE loans to carry 30% (rather than 50%) more capital than normal commercial real estate loans. It is not clear that this measure is sufficient to compensate for the increase in loans that will be subject to a higher capital charge. By contrast, H.R. 2148 would retain and broaden the exemption (while retaining the 50% capital surcharge). First, the exemption, as currently construed by bank regulators, does not allow a developer to count appreciation in the value of real property when calculating compliance with the 15% contributed capital requirement. Under H.R. 2148, the value of contributed real property would be equal to its appraised value at the time of contribution. Second, the exemption, as currently construed, requires all contributions by a developer to stay in the project—even those in excess of the 15% contributed capital requirement. Under H.R. 2148, there would be no restriction on distributing capital in excess of the 15% requirement. Another area of uncertainty in the current rules is whether unsecured ADC loans may be subject to the higher capital charge. Under H.R. 2148, only ADC loans secured by real estate would be subject to the higher capital charge, while under the Proposed Rule, loans that are not secured by real estate still could be subject to the higher capital charge. While there are differences in approach, these two proposals recognize the need for reform and likely will generate momentum to address the current rule’s shortcomings. While the proposed legislation has significant merit and industry support, it does not seem to have been given priority on the Congressional bank regulatory reform agenda. In addition, Congress generally tends to delegate the specifics of complex and technical capital regulation to the federal banking agencies. Accordingly, it is more likely than not that needed reform in this area will be implemented through the regulatory process. However, the federal banking agencies are not likely to turn a blind eye towards H.R. 2148, especially since this bill received bipartisan support when it passed the House. One would hope to see the best of both proposals emerge from the process. ¹The bill has been referred to the Senate Banking Committee although it was not included in a comprehensive financial regulatory reform bill proposed by Chairman Mike Crapo (R-ID) in November 2017. Henry M. Fields is Senior Counsel at Morrison & Foerster and has represented domestic and international financial institutions for more than 40 years. 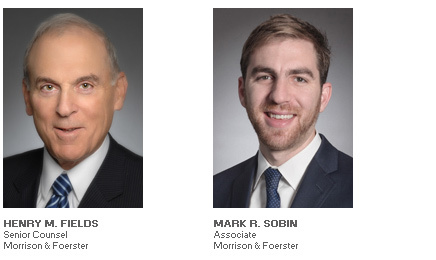 Mark R. Sobin is an associate in the Financial Services Practice Group of Morrison & Foerster’s New York office.